If you've seen me painting away in Artist Alley, then you've probably noticed my Aqua Tote contraption, the perfect solution for painting on the go. 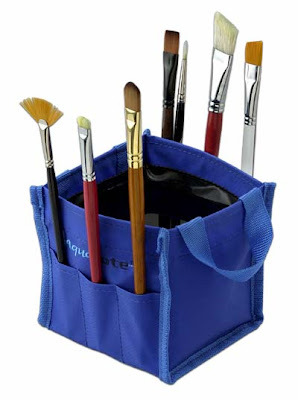 It's water-tight, holds my extra brushes, and folds perfectly flat. It's also fairly inexpensive. And here's a nice drawing of a water tower. Thirsty? Mine just broke! I'm so upset. I don't even know how it broke. Nice Black Widow sketch. She's one of my faves! Sorry to hear that, Narco. I haven't had a problem yet, but I will surely report it if I do. And thanks, Christina. I wish I got to draw more of her. She only shows up for one panel in the story I'm illustrating.